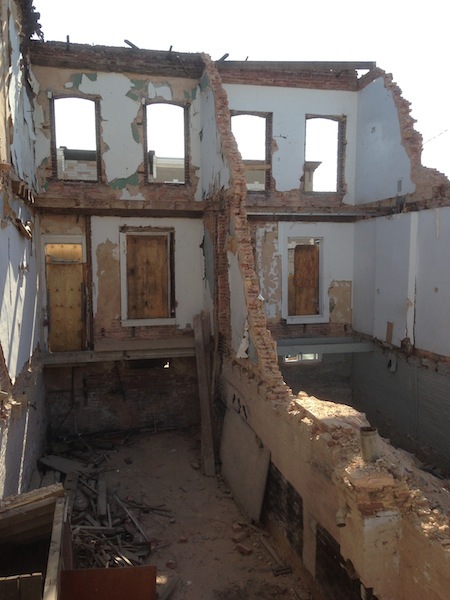 Anatomy of A Rowhouse Roof: Part 1! It’s hard to overstate the importance of a solid roof to a structure, but let’s try: the roof is the most important thing in the history of buildings, ever. Ok, so that might be a stretch, but it’s not that much of a stretch. The basic function of the roof is to protect the building (and its inhabitants) from the elements, be they rain, snow, wind, sun, dust, you name it. In our work, we often see what happens when a roof is compromised. As soon as water is able to penetrate the building envelope, the condition of the interior deteriorates rapidly: water trickling down party walls causes bricks to erode and plaster to crumble. These bits then accumulate on soaked floorboards, which themselves sit on water-logged (and therefore rot-prone) joists. After a decade or so, you’ve got a pile of mush surrounded by brick walls. All that’s left of this roof system is a lone rafter. It’s likely that this roof has been gone for some time, as virtually none of the interior of the building remains. Having established the importance of a roof, let’s turn our attention to the way that late 19th and early 20th century rowhouse builders built these things. There’s more variation than you might expect, so we’ll tackle this subject by looking at different blocks of houses. First up is the 1500 block of E Federal Street, built around 1888. You can see the long purlins spanning across the beefier rafters. Towards the top left of the frame, the purlins end at the cornice. In this framing system, 2.5×8 rafters spanning the width of the house are pocketed into opposing party walls every five to eight feet. Purlins, 12-16′ long 2x4s spaced every two feet run front to back, spanning three rafters. In other words, the purlins span from one rafter to another, bridging and, because of the long span of a relatively flimsy 2×4, bearing on a third rafter in the middle of the span. Atop and perpendicular to the purlins, 1″ thick roof decking spans from party wall to party wall. Atop the purlins is 1″ thick pine roof decking. What’s notable about this framing system is the significant spacing between the beefy rafters. The long purlins are being asked to do a lot of work holding up the roof decking, tin, and tar. Supporting this weight, the purlins flex downwards. If the purlins are supple, they’ll bend and transfer weight to the rafters. If the purlins are brittle, they’ll crack. The rafter closest in the frame is buckling under all the weight it’s had to carry over the years. If I had to bet my ducats, I’d say that the builders of these houses thought they could get away with using as few 2x8s as possible, relying on cheaper 2x4s to carry the load. The results are mixed: true, most of the roofs in the houses we worked in were intact, but all of them showed seriously stressed rafters or purlins. Even if the initial framing was sturdy enough to support the original roof coverings, it’s clear that it was not up to the task of supporting decades’ worth of additional layers of tar. Our readers out there with careful eyes and unusually strong memories may have noticed that the maiden name in the title of this post seems familiar. Nearly two years ago, we glimpsed into the life of Frank Vanik, a blacksmith who lived at 2438 Eager Street, site of our very first deconstruction project. 2438 E Eager Street, as we found it nearly two years ago. When we arrived on the scene, 2438 Eager Street had been long abandoned and was essentially four brick walls surrounding a pile of rotted lumber. Through census records, however, we were able to track Frank Vanik’s path from neighborhood blacksmith to shipyard worker to auto mechanic, a trajectory that we felt aptly captured the moment he lived in. Two years after we first wrote about him, we’re happy to report that we have a bit more information about Frank, as well as some vividly and beautifully remembered stories of his former neighborhood, thanks to Janet Divel (née Vanik), his grand-niece, the woman you see in the photo below. “Growing up in Baltimore City was a mixture of sounds, smells, sights and people. We in the late 40s, 50s, and early 60s lived a unique way of life, something that is disappearing. We were mostly growing up in a working class/low income area; there was no assistance those days. We never had much money, but we had the neighborhood, which we were all connected to and if someone needed help, if a neighbor could help they would…We all were responsible for something that we called neighborhood. Neighbors would be out front and in the alleys with their hoses and brooms and cleaning the streets and alleys. There was a lot of pride how your street and house looked not fancy but clean. No one had air conditioning. In the summer we would all sit out front on the steps. We were taught that all of us knew those two words, respect and responsibility. One of my jobs when I turned 9 was to scrub the front steps which were marble slabs, take a bath every Saturday, run errands, clean the vestibule which was the very small entrance and get a job, when out of school; the average age out of school 15/17 years old. After graduating the eighth grade from St. Wenceslaus School in 1953 on Collington Avenue and Madison Street, which is now a housing unit. I believe the church is still there. I went to St. Andrews Business School on Washington Street and Madison Street for two years after graduating I got a job. Now it’s a parking lot for Hopkins Hospital. Patterson Park, located on Patterson Park Avenue and Baltimore Street was the only country I grew up with. There was a playground and in the winter a place to sleigh ride. The park was fairly safe then, and we were young, not teenagers yet, but always went to the park with other friends. We looked out for each other. Growing up in the city made you street smart at a young age. The boys in the neighborhood were always told on those narrow city streets, or yelled at, to go to the park to play baseball. When they hit the ball with a bat there were many windows in the way. Patterson Park was 4 blocks from my house. There was a Chinese pagoda type building on the Patterson park Avenue side which was always a mystery to me. The sounds were lots of things. There was a church on Patterson Park Ave and Orleans St. that would chime every quarter, half, and whole hour. After a while you liked it. I knew what time it was. The traffic sounds on the 2400 block of Orleans Street, which was down the corner from house, all day and night. A huckster would come down the street with a horse and wagon selling watermelon and other fruits and veggies yelling “watermelon.” He would cut a pyramided slice for you to test it for sweetness. Down the back alley there would come a guy once a week yelling “get your scissors and gives sharpened here.” As the 50s disappeared, so did the hucksters. There was a stable on N. Bradford Street and E. Monument Street and a place where people made brooms. When they tore that down, it was over for that way of life. Now the smells were great during the summer. Less than a block away there were two crab houses on the 2400 block of Orleans St., Patterson Park Avenue and Milton Ave. They were the Blue Point Crab house and Gordon’s Crab House. They would pick the crab meat there behind large glass windows, you could watch the ladies working. They had a menu of fresh crabs, steamed crabs, crab meat, crab cakes, soft crab sandwiches and crab cake subs. The local grocery and produce stores would always have soft crabs lying on a table with something that looked like wet hay lying on the top and you could pick out the soft crab that you wanted. One of the more popular things were coddies, shaped like a small hamburger made of potatoes and cod fish. The local stores would also have them on their counters with mustard and saltine crackers. You could buy one for 5 cents. Add a Pepsi with that and you had a meal. From my upstairs window we could see the Esskay Meat factory sign, which was on 3800 East Baltimore Street til 1993, so depending on the way the wind blew, you could smell various meat smells. This place was one of the main employers in the area in the 40s, 50s, and 60s. It’s like the factories disappeared and the city changed for the worst. The sights and people were just about anything you could imagine. Busy and vibrant is the words I can think of. Local clubs (gangs) started appearing in the 50s, names like the Imperials and Imperialets, with red and white jackets, the Joyriders with green and white jackets, 7th wards, and many others. Just to make it clear, we were not violent or disrespectful, we were a bunch of kids having fun. The hangout places were North Rose Street and East Jefferson Street, the Arundel on North Bradford Street and East Monument Street and Patterson park Avenue and Madison. Buses were the main type of transportation those days, especially in the early 50s, more and more of the young guys started to buy cars, old cars, nothing new, and they sure loved those cars. Old Fords, Chevrolets, and anything they could afford. Most of the cars were primered, looked like a dull black paint, and were never really painted. Who could afford that. There were garages near the train tracks off of North Luzerne Avenue, small, but that was the busiest place for all the young guys. To the reader unversed in brick terminology, the title of this post probably seems nonsensical, so we direct your attention to our primer on brick frogs before you go any further. To briefly recap, frogs are indentations made in the bed of a brick that have the following practical advantages: 1) they reduced the amount of clay needed to make a brick, 2) they lightened the brick 3) they created a better key for the mortar to adhere to, 4) they offered a surface for the brick maker to impress his name upon, acting as an early canvas for advertising. We are most concerned with this last item, the branding potential of a lowly brick. First a bit of history: brick frogs seem to date the late 17th century, but only came into use in the US during the late 19th century. The Hudson Valley region, which supplied most of the bricks to the voracious New York City building market, saw a progression of bricks featuring a brand on the surface of the brick (as seen below) to a recessed frog, to even deeper frogs (seen further below). The recessed frog seems to have become popular (for Hudson Valley brickmakers and others) around the turn of the century. To supply the booming NYC market, hundreds of brickmakers lined both banks of the Hudson all the way past Albany, sending their bricks to the city by barge. Here, you can imagine the branded frog playing an important role: amid the atmosphere of fierce competition in a booming industry, the frog allowed proud brickmakers to advertise their name and catch the eye of builders. Imagine you’re a bricklayer for a 20 story building, and you’re handling thousands of bricks a day, all of them marked with the name “MASSEY”. The name impressed upon the brick probably becomes impressed upon your mind, and when your current load runs out, who’re you gonna call? In New York City, virtually every old building brick you come across will have one of several hundred brands on it. In Baltimore, brick hunting can be an exercise in frustration, because it seems there are hardly any bricks with frogs and/or names on them. Sure, you’ll see a “CALVERT” or a “HOMEWOOD” occasionally, maybe an “OXFORD” here or there, but that’s about it. During our deconstruction projects, we’ve handled well over one million bricks, and the tally of bricks with frogs stands at: zero. What gives? In July of 1899, the Baltimore Brick Company was formed when it bought up almost all of the competing brickmakers in Baltimore, essentially becoming a monopoly in the Baltimore brick game. Along with several other smaller firms, the Baltimore Brick Co. absorbed these fine brick manufacturers: Baltimore High Grade Brick Co., A. & F. Wehr, Weaver & Harman, Maryland Brick Co., Pitcher & Creager Brick Co., Wm. H. Perot, Jas. R. Busey & Son, Smith & Schwartz Brick Co., H. W. Classen & Co., Cromwell Bros., John A. Knecht & Sons, Druid Brick Co., Dan’l Donnelly & Sons, John A. Allers & Son. In the map of East Baltimore below, from 1876, you can see the Donnelly, Smith, Robinson, and Perot brickyards. In this map of the same area from 1906, you can see “Baltimore Brick Co.” scrawled over the entire area. The formation of the Baltimore Brick Company is a prime example of industrial consolidation, as behemoths were created from the agglomeration of many humble enterprises. Three years after its formation, the Baltimore Brick Co was churning out 150,000,000 bricks per year. To be sure, some venerable Baltimore firms resisted the lure of the mighty BBCo; Burns and Russell, whose bricks were used in the construction of the Shot Tower, Johns Hopkins Hospital, and Old St. Paul’s Church, remained in business, as did several specialty clay companies. But it’s fairly safe to say that any rowhouse built in the city after 1900 used common bricks supplied by the Baltimore Brick Company. Which answers, partially, why we believe our bricks have no frogs. One of the main attractive features of the frog, the ability to promote a brand, would probably have been deemed unnecessary by the BBCo, as monopolies generally don’t need to advertise! This alone probably wouldn’t account for the lack of a frog in our Baltimore bricks, but it certainly seems like a plausible factor. The Baltimore Brick Company, by the way, operated in the city until 1968. It’s tricky to pin down exactly, but it seems like parts of the company were eventually swallowed up by larger regional players, which were then themselves ultimately swallowed up by a massive multi-national brick company. Way back when, we highlighted one of the pavers that sits below our long-since-asphalted streets here in Baltimore. These pavers were used to pave streets before asphalt became commonplace in the 1920s. We briefly discussed how a paver (also called a ‘block’) operation required more sophisticated machinery and infrastructure than your average brick operation. Because of this, Baltimore actually imported much of its stock of 10 lb pavers. Today we’ll look at another block that can be found under the streets of Baltimore. The town of Windber, PA started as a company town for the Berwind-White Coal Mining Company (see what they did there?). The company brought over large amounts of Eastern European immigrants during the early years of the 20th century to work in the mines, and by 1910, the town that had formed only years earlier had a population of nearly 10,000. Windber became a minor boomtown, with sawmills and brick manufacture joining coal mining as the main industrial activities. The W.P. Kelley Brick Co, which got off the ground in 1901, seems to have been behind the “Windber” paver brand. Next to the “Windber” name, you can see the four ovular lugs that acted as natural spacers when these pavers were laid on their edge, as seen in the photo. You can also just make out smaller circular bumps in the top corners of the paver: these were caused by indented screws fixed to the face of the mold. Over a year ago, we spotlighted the man who built the houses we deconstructed on Eager Street, Frank Novak. 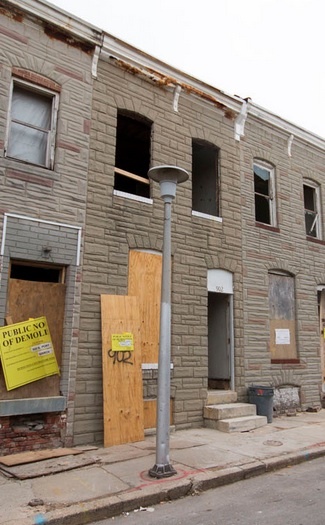 Legend has it that Novak built 7,000 rowhouses in East Baltimore, beginning in 1899 with the 700 block of Patterson Park, and moving north and east to help construct Baltimore’s rapidly developing suburbs. James’ mother was named Florence, and in the photo below you can see her with her cousin Mildred Raborg in front of Novak’s Saloon. The photo was taken in 1918. You can see that some of the original details remain: the ornamental brackets supporting the entryway are still there under several coats of paint, as are the marble slabs framing the entry landing. James also sent along Frank Novak’s obituary, which we’ll discuss in more detail in a later post. Bohdal lived at 900 N Port Street, and just next door, in 902, lived the Widra family. In 1910, the Widra family consisted of Peter, his wife Rose, and their three children, Rudolph, Charles, and Helen. Like his neighbor Bohdal, Peter was a wireworker. In fact, the two neighbors owned a wire works together at 717 E Fayette Street, appropriately named Widra and Bohdal. It seems the neighbors eventually went their separate ways, as both Widra and Bohdal opened their own businesses. 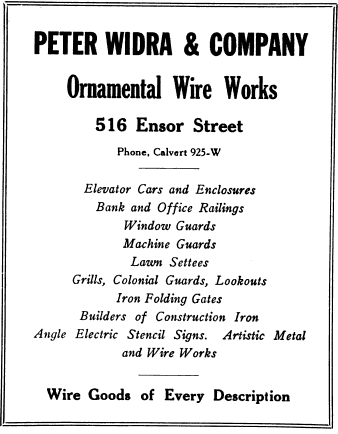 Peter Widra & Company Ornamental Wire Works specialized in elevator cars, lawn settees, and bank railings, among other things. They operated out of a factory at 516 Ensor Street. By the time the 1920 Census was taken, Peter had died, and Rose was running the business. The family still lived at 902 N Port, though Rose’s mother, brother, and niece had moved in. Charles, who at 15 was the oldest Widra son, did not enter the family trade, and instead worked as a clerk at an insurance agent. In 1930, Charles had moved out to the suburbs where he worked as a press operator at an aircraft factory. By 1940, he had moved back home to East Baltimore, though he kept his work as an aircraft mechanic. The rear of 902 Port after we took off the roof, peeled up the flooring, removed the joists, and manually took down the walls. One imagines that the work of an aircraft mechanic must have been somewhat of a natural extension to the work of a wire worker. Maybe it was in Charles Widra’s blood? In looking at the earliest listing for the Widra family, the “d” in the name seems cut short, almost to the point that it looks like an “a”. The name seems to be written as “Wiara”. This could be the case, of course; perhaps the immigration official or census taker or whoever first wrote down the name “Wiara” wrote it in such a way that it looked like “Widra” and the new name just stuck. It is quite possible that the family’s original name was “Wiara”: in old German, it means “wire”.